Founded in 1921, McWane, Inc. is a family owned business based in Birmingham, Alabama, with 14 iron foundries and related businesses across the United States, Canada, Australia, China, India and the Middle East. 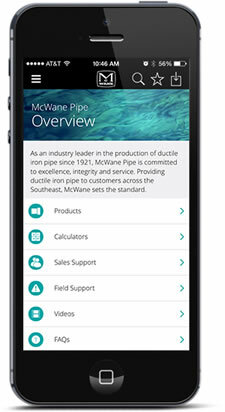 McWane's divisions focus on the safe, environment-friendly manufacturing of ductile iron pipe, soil pipe, soil fittings and utility fittings, waterworks valves and fire hydrants, propane and compressed air tanks and fire extinguishers. McWane entered into Indian market to support its group companies in Design, Product Development and Information Technology. McWane India Pvt. Ltd. (MIPL) started its operations as Service division in India based at Coimbatore back in 2011. McWane is proud of its heritage, and we will continue our tradition of creating world-class quality products through our recognized family of manufacturers. McWane's global footprint has made an impact around the world. Our growing global operations are expanding this footprint to bring water to the world.